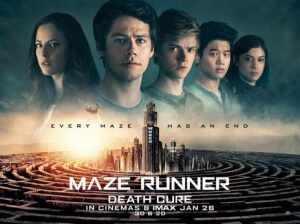 It’s been over two years since the last Maze Runner movie, and only now is the series finally getting to its mercifully-not-split-into-two finale, at a point where nobody even remembers much about where things left off unless they’re really keen on rewatching both the previous movies. To the movie’s credit, that extended time gap is completely understandable; during filming, star Dylan O’Brien was seriously injured, and production was shut down indefinitely to allow him to recover, with cameras rolling again nearly a year after the incident, which in turn pushed the film back way off from its original 2017 release date. However, as unavoidable as the circumstances were, it does mean that the film is coming over two years since audiences last saw these characters and this story be played out by them, and a lot of films have come and gone since then which means it’s likely that most people, except for the extremely dedicated fans who continued watching both movies on home release, have largely forgotten most of it until watching this new one. It doesn’t help that the film just begins without much of a recap, so you’re suddenly following characters you have little recollection of from, again, over two years ago and have to remind yourself from within the darkest depths of your memory of who they are. That can be a little difficult to get your head around, especially if you haven’t seen any of these movies since they first came out (and if you’re going into this without having seen either of the previous movies, then I can’t imagine how much more complicated it probably would be). But all of that aside, is Maze Runner: The Death Cure a worthy if overdue conclusion to a YA film series that had no right being as passable as it was? Well, it has its strengths, just as much as the previous films, but it’s also one of those cases where they go a bit too all out to make this finale seem as big and epic as they can, without much in the way of settling on a reasonable and satisfying conclusion. If you are curious about how this film plays out, we see lead character Thomas (O’Brien) heading out to save his friend Minho (Ki Hong Lee) from the clutches of sinister organisation WCKD – who really should have rethought that acronym in their development phase if they wanted to not appear as shady as they are – at their headquarters in the “Last City”, a walled-off district of skyscrapers that shuts out the people infected with the “Flare” virus that eventually turns them into zombies. He heads into his mission with friends Newt (Thomas Brodie-Sangster), Frypan (Dexter Darden), Brenda (Rosa Salazar) and Jorge (Giancarlo Esposito) by his side, and together – as well as a with a few other allies both old and new – they infiltrate WCKD’s base and attempt to rid themselves of their presence once and for all. What should be a straightforward in-and-out rescue movie that simultaneously ties up all loose ends, instead goes on to become a punishingly long and bloated finale that unnecessarily makes itself out to be more epic than it really needs to be. At nearly two-and-a-half hours long, the film takes its precious time with the story which really could have been trimmed down at several instances to get itself to the point quicker and faster, but alas, director Wes Ball is adamant that with this being the final film in this trilogy it needs to be as epic-length as possible, when really none of what came before really warrants this having a big bombastic conclusion in the first place. Without going too much into plot detail, this is the kind of climax that involves explosions aplenty, buildings being destroyed, characters we’ve become acquainted with meeting their fate, and all because of a teenager’s mere quest to save his friend from a government facility. It’s an instance where a lighter conclusion, one that’s heavier on character and story instead of one big explosion after another, probably would have helped it a great deal to stand out from other finales to YA movie series. There are a few things about it that do prevent it from fully being a drag to sit through, if only because of its far-too-long running time. There’s a character from one of the previous films who returns in this, in quite a large role that was surprisingly left out of all the previews for this film (surprising in the sense that it’s a fairly popular actor who plays this person), and without giving away who it is in case you still want to be surprised, it was great seeing this actor and character back in action seeing as how they were one of the highlights of that previous entry they were in, and they’re just as fun to watch in this film as they were previously. In addition, while there are a lot of action sequences that seem to go on for quite some time – including that climax which begins to make the city-wide destruction in Man of Steel look somewhat minor by comparison – the ones that stand out do so primarily because of how strongly choreographed and shot they are, even when they make little to no sense as to how they would actually function in any sort of reality, including this one. And like that, with a bloated but absolute finish, the Maze Runner film series is finally wrapped up. While I can’t say that any of these films are up there with some of the best YA adaptations, they have been for the most part far better than they had any right to be, and aren’t quite as worth getting riled up about as some people have been. For what they were, they were serviceable movies based off a serviceable series of books, and seeing how bad some of these YA movies can get, let’s be thankful that they could have been a hell of a lot more intolerable. Maze Runner: The Death Cure wraps up the series just fine, but not without a wildly unnecessary epic feeling to it and a long and bloated running time that can be trying for the most impatient audience member.